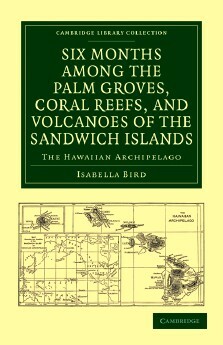 The Hawaiian archipelago : Six months among the palm groves, coral reefs, and volcanoes of the Sandwich Islands / Isabella L. Bird. - New York : Cambridge university press, 2010. - 514 p. : ill., maps ; 22 cm. NOTE DE L'ÉDITEUR : Recommended an open-air life from an early age as a cure for physical and nervous difficulties, the indefatigable Isabella Bird (1831–1904) toured the United States and Canada, Hawaii, New Zealand, Australia, the Far East, India, Turkey, Persia and Kurdistan. Her accounts of her travels, written in the form of letters to her sister, were bestsellers. In 1875 she published her account of six months in the Hawaiian archipelago. During this time she explored the islands on horseback, visiting volcanos, climbing mountains, and living with the natives. The book includes considerable detail about the lifestyles, customs, and habits of the people she encountered, and of the geography and geology of the islands. Her enthusiasm for Hawaii and its people is evident from her vivid descriptions, but she disliked the restrictive atmosphere of the foreign settlements. The book includes outlines of the history and economy of the islands. HENRY ADAMS : Maintenant que je fais le point de notre tournée hawaienne de ces dix derniers jours, elle m'apparaît comme une expérience remarquable, et d'un genre tout à fait nouveau pour d'ordinaires voyageurs en guêtres. Si vous avez la curiosité de savoir ce que d'autres ont pensé de scènes analogues, lisez le récit de Miss Bird dans les îles Sandwich ; pour moi j'ai pris soin de m'abstenir de lire ses observations, car je sais qu'elle se conforme aux principes les plus sains, alors que je brûle de faire le contraire. Mais ainsi vous verrez sûrement les îles telles que devraient les voir les voyageurs, je veux dire si vous la lisez ; elle vous racontera tout de ce que je devrais avoir vu et senti ; pour elle, le volcan s'est si bien conduit et a si correctement montré ce qu'il savait faire, comme il le fallait, que c'est un plaisir de suivre son récit. Pour nous, il fut absolument plat, et je me sens tout à fait en sympathie avec un Anglais qui, nous dit-on, après lui avoir jeté un seul coup d'œil se détourna et ne regarda plus que les planètes et la Croix du Sud. EXTRAIT One does not forget the first sight of a palm. I think the banana comes next, and I see them in perfection here for the first time, as those in Honolulu grow in " yards, " and are tattered by the winds. It transports me into the tropics in feeling, as I am already in them in fact, and satisfies all my cravings for something which shall represent and epitomize their luxuriance, as well as for simplicity and grace in vegetable form. And here it is everywhere with its shining shade, its smooth fat green stem, its crown of huge curving leaves from four to ten feet long, and its heavy cluster of a whorl of green or golden fruit, with a pendant purple cone of undeveloped blossom below. It is of the tropics, tropical ; a thing of beauty, and gladness, and sunshine. It is indigenous here, and wild, but never bears seeds, and is propagated solely by suckers, which spring up when the parent plant has fruited, or by cuttings. It bears seed, strange to say, only (so far as is known) in the Andaman Islands, where, stranger still, it springs up as a second growth wherever the forests are cleared. Go to the palm-house, find the Musa sapientium, magnify it ten times, glorify it immeasurably, and you will have a laggard idea of the banana groves of Hilo. The ground is carpeted with a grass of preternaturally vivid green and rankness of growth, mixed with a handsome fern, with a caudex a foot high, the Sadleria cyathoides, and another of exquisite beauty, the Micropia tenuifolia, which are said to be the commonest ferns on Hawaii. It looks Elysian.